Kartik and Naira’s pre-marriage functions are going on. Kartik is given the milk bath and done Abhishek in a royal way. Kartik’s Mausi makes an entry. She is close to Kartik’s heart. Kartik gets embarrassed by having the milk haldi bath. Everyone pull his leg. Naira and her family select the engagement ring for Kartik. Everyone gives their opinion. Naira chooses a ring. 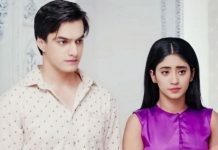 Kartik and Naira meet the pandit and get the solution to keep fasts for 12 weekdays, instead changing Naira’s name to Sumegha. They solve the matter and tell Dadi about pandit’s solution. Naira gets glad that her name and identity will not change post marriage. Kartik is eager to reach Singhania house and asks his family to get ready fast, they have to leave. The family teases him for being in hurry. Kartik reminds Dadi not to miss mahurat. Naira sends her pics to Kartik, which makes him excited to see her soon. Goenkas reach the Singhanias house. Singhanias welcome Kartik for the engagement. The toran falls down on Manish while Goenkas were entering the house. Suwarna tells them that Lav and Kush did the mischief. 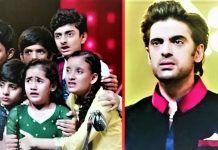 Dadi scolds Lav and Kush for making mistakes. Bhabhimaa asks her to leave it, as kids do mischief. The difference between Goenkas and Singhanias behavior and upbringing will be seen.